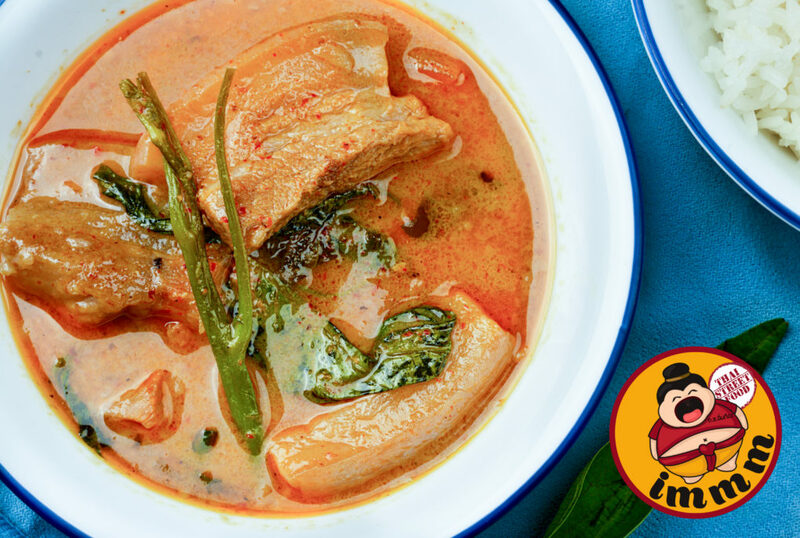 Gaeng Tae Poe Recipe with "She Shimmers - Thai Home Cooking"
Thank-you food critic and blogger Leela Punyaratabandhu for recommending our dish as one of your favorites! We’re proud and honor to serve delicious authentic Thai food in Chicago. (1 Pound) of Boneless Pork Belly – Cut Slices ½-Inch-Thick then Cut Each Slice Crosswise 1½ Inches Wide. Toast the cumin and cardamom seeds in a dry skillet over low heat for about 2 minutes. Afterward, transfer to a granite mortar. One at a time – add the chilies, salt, shrimp paste, lemongrass, curry paste, shallots, and garlic. Grind all ingredients until smooth after each addition. Put the paste with the vegetable oil in a large wok or Dutch oven over medium-high heat, for about 1-2 minutes. Add the pork belly and stir just until the pork looks taut on the outside. Afterward, add coconut milk, fish sauce, tamarind, and palm sugar. Bring the mixture to a boil, cover, and simmer on medium until the pork is tender with some bite to it. This should take about 20-25 minutes. Taste the sauce. Adjust the seasoning as needed with more fish sauce, tamarind, and sugar to achieve the three flavors of sweet, sour, and salty. Stir in the water spinach and the lime half. Push it all down with a spatula. Add more water, if necessary to get everything submerged.Turn up the heat to high to bring the mixture back to a boil. Once it boils, turn off the heat immediately and let the residual heat cook the water spinach.Let the curry stand 30 minutes so the lime infuses the sauce. Remove and discard the lime after that. Serve with rice. *** But if you can wait, let it sit for at least 4-5 hours (in an air-conditioned kitchen) or let it cool completely then refrigerate it overnight and eat it the next day.